There are so many gems to be found in this lovely little volume of animal essays. Translated from the French (some had to be left out because the puns were just not translatable) and collected beginning in 1896, Renard's Histories Naturelles were illustrated at one time by Toulouse-Latrec. They are full of humor, understanding , joy and compassion. Some are so short but also so true, I thoroughly enjoyed it. Start with one of my favorites, The Finch, and you will see what I mean. The natural world in all its richness, glimpsed variously in the house, the barnyard, and the garden, in ponds and streams, and at large in the woods and the fields, including old friends like the dog, the cat, the cow, and the pig, along with more unusual and sometimes alarming characters such as the weasel, the dragonfly, snakes of several sorts, and even a whale, not to mention ants in their seeming infinitude and a single humble potato—all these and more are the subjects of what may well be the most deft and delightful book of literary miniatures ever written. In Jules Renard’s world, plants and animals not only feel but speak (one species, the swallow, appears to write Hebrew), and yet, for all the anthropomorphic wit and whimsy the author indulges in, they guard their mystery too. Sly, funny, and touching, Nature Stories, here beautifully rendered into English by Douglas Parmée and accompanied by the wonderful ink-brush images of Pierre Bonnard with which the book was originally published, is a literary classic of inexhaustible freshness. into the city’s most prestigious literary salons. His marriage in 1888 to Marie Morneau brought him a large dowry and allowed him to devote himself to life as an homme de lettres and to found the literary review Mercure de France. For the rest of his short life Renard would spend the warmer months in Chitry, where like his father before him he became mayor. In Paris he lived the life of a member of the Académie Goncourt and counted among his friends Alphonse Daudet, Edmond de Goncourt, Anatole France, Paul Claudel, and Sarah Bernhardt. 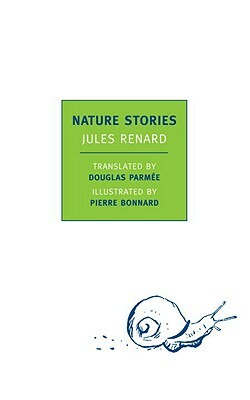 In addition to Poil de carotte and Histoires naturelles, Renard is best known for his five-volume Journal, cited as an influence by authors as diverse as W. Somerset Maugham, Susan Sontag, Donald Barthelme, and Samuel Beckett. Among his other works are Le plaisir de rompre, L’ écornifleur, and Huit jours à la campagne. Douglas Parmée (1914–2008) was a lecturer in modern languages at Cambridge and a Lifetime Fellow of Queens’ College. He translated many works of classic and contemporary literature from French, Italian, and German, receiving the the Scott Moncrieff Prize for French translation in 1976. NYRB Classics publishes his translations of The Child by Jules Vallès and Afloat by Guy de Maupassant and in 2011 will publish his translation of Irretrievable by Theodor Fontaine. Pierre Bonnard (1867-1947) was among the most iconic and original Post-Impressionist French painters, and a founding member of the avant-garde group Les Nabis.